The Kilauea volcano emergency continues to carry on, with no real end in sight. It can be hard to make plans to serve the public when what’s guiding you is an erratic volcano with frequent explosions. The Kilauea volcano emergency, which began May 3, has now reached Guam, experts say. Air quality is a major concern for residents in the area on the Big Island of Hawaii and additional evacuations have been ordered. Emergency Disaster Services (EDS) personnel and volunteers from The Salvation Army have been on the ground to support those affected by the Puna lava flow since the initial explosion—helping with meal coordination, hydration, and emotional and spiritual care at the shelters in Pahoa, Keaau, and Puna on the Big Island. Serving in the midst of a sporadic disaster like a volcano can pose unique challenges, even for seasoned emergency disaster personnel. Chamness and his team oversee and staff a distribution center in Pahoa that has been providing essential items to those in need, including breathing masks, tarps, flashlights, bottled water, and sleeping bags. At least 51 homes have been destroyed and an estimated 2,000 people have been displaced since the Kilauea volcanic emergency began on May 3. While grateful to be safe, Kilauea’s unpredictable behavior has some residents growing weary of being cooped up in a shelter for weeks as the emergency carries on with no real end in sight. Making things worse for local residents, cruise ships have canceled stops at major tourism posts on the island as a result of the conditions, and hotel and restaurant business has taken a major hit. The closure of the nearby Hawaii Volcano National Park alone is costing the island an estimated $166 million, according to the National Park Service. According to Lt. Colonel Joe Posillico, who’s been serving meals to those in need on the island for the past three weeks, there are five total shelters—and they’re all full. Mental health and spiritual care is a top priority for EDS personnel in the midst of such a disaster given its uncertainty. Studies have shown that residents coping with volcanic eruptions and other natural disasters can face symptoms of post-traumatic stress disorder and depression with middle-aged and older adults among the most vulnerable over the long-term. “A lot of what we do is talk with the residents and listen to their stories,” Posillico added. He said meal delivery poses another challenge for those serving on the frontlines because there aren’t any canteens available due to how remote the area is. Meals must be prepared in a certified kitchen, so The Salvation Army has been contracting with or receiving donations from local restaurants. As the volcanic activity continues, large volume meal donations from local restaurants and certified kitchens are needed to help sustain the relief efforts. A team of experts from other territories have arrived to assess the needs on the ground and to create a plan, led by John Berglund, Western Territorial EDS Director. He’s joined by Nicholas Nguyen, EDS Director for Southern California, and Jenni Ragland, EDS Director for the Alaska Division, who both bring significant experience in disaster management as well. Chamness said aside from the caustic nature of the gases and “vog”—volcanic smog mixed with dust—and the ongoing air quality concerns, the volcano experts are planning for a seismic event or major eruption. The Salvation Army is working with the county, FEMA and the Red Cross to coordinate ongoing relief efforts and planning. Some residents have left the island altogether while others have found a place to stay elsewhere with family or friends. But for those at the shelters awaiting news, some have decided to just wait and see how the spirit moves them, Posillico said. 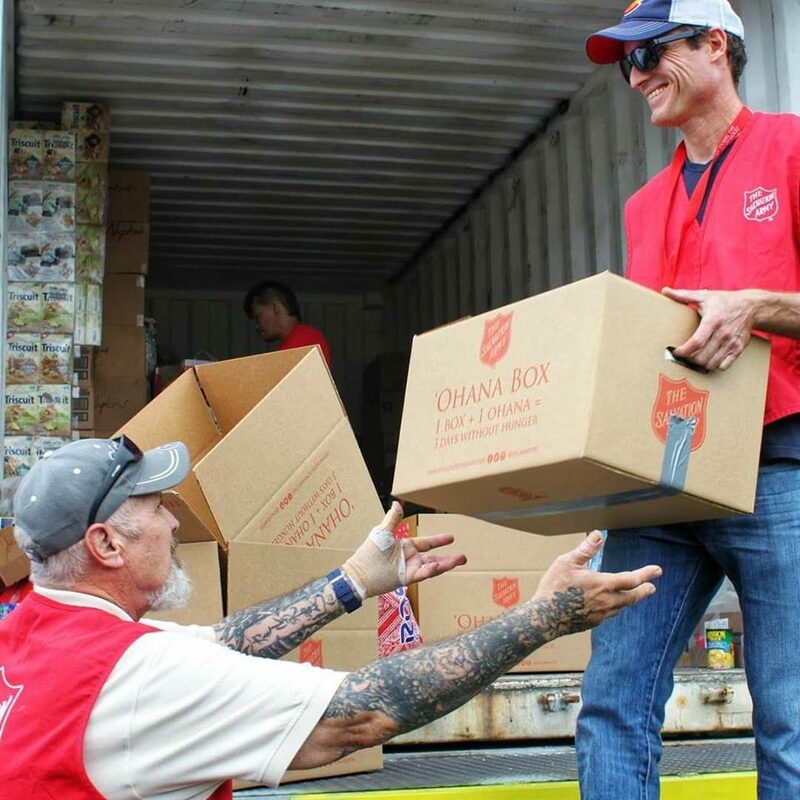 To support relief efforts, visit hawaii.salvationarmy.org.